A moment to relax while your hair thanks you. 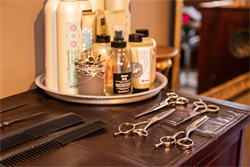 Shampoo and conditioning treatments specific to your hair. Spitcurl provides a calm and pleasant environment, although you won't be there very long! Known for her prompt, efficient service, sole-proprietor Janet Torelli provides attractive, texture-appropriate styles in record time. Her savvy clients enjoy expert hair cutting and all-over color, highlights, lowlights, gloss, and natural-looking haircolor for men. She practices uncomplicated, practical color correction and smart styling techniques that accommodate busy lifestyles. Creating balanced, versatile shapes for curly-girls is her specialty! Book an appointment. Janet would love to say hello. your best in record time. Her services will keep you looking good all while accommodating your busy lifestyle! Janet can't wait to meet you!